The Proudies Foundation Inc. was incorporated on 16th July 2012, endorsed as a deductible gift recipient, and granted a Charitable Collections Licence (licence number 21405) on the 16th November 2012. The Foundation was set up to support Warrick Proudlove who was seriously injured in a freak car accident in July 2011 when the car he was travelling in as a passenger collided with a horse. Warrick sustained major head injuries which resulted in significant brain damage. He remains in a vegetative state and requires 24 hour care and whilst he has started to communicate through squeezing and blinking, his responses are inconsistent. Warrick was 19 at the time of his accident and had recently moved from Albany, his home town, to Perth to further his football career with the Claremont Football Club. 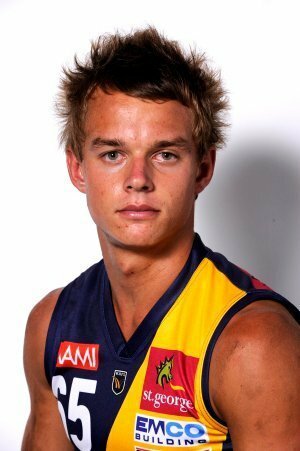 He was a talented footballer who became an integral part of the Claremont Football Club and had the potential to be a future AFL draft pick. Warrick was well known and respected in the Albany community not only for his talents as a footballer but also for his ethics and personality, attributes that made him a role model amongst his peers. He was respected, trusted and admired by all that met him and he remains a well- loved member of the North Albany Football Club and community who continue to support him and his family. Nearly 5 years after his accident he remains an inspiration to his many friends and family who go to extraordinary lengths to support him and raise funds for his rehabilitation and care. Unfortunately Warrick was unable to make a claim for compensation and as a direct result of Warrick’s accident the State Government is implementing no fault insurance through our motor vehicle fees to ensure no one else suffers the same fate. The costs of rehabilitation, care and equipment required to ensure Warrick receives the best care are enormous and so the Foundation continues to fundraise not only to cover the costs today but to ensure there are funds available for future expenses. All funds raised by the Foundation go directly to Warrick’s care. The members of the Foundation are volunteers who receive no monetary payment for their services. The reward we receive is knowing that the work we do enables the Proudloves to focus their energies and love on Warrick’s day to day needs, rehabilitation and treatments. The Proudloves are truly grateful for everything that people have done for them and continue to do for their much loved son. They take nothing for granted and are inspirational people and we hope that like the members of the Committee and the Proudies community, you too will be inspired by their story and be able to assist either through sponsorship, donations or nominating for the Committee. The Proudies Foundation has been in existence for four years. During this time and thanks to so many generous donors; sponsors and fundraisers it has raised a total of just over $176,000.00 all of which assists in covering the costs of providing Warrick with the best care possible. This is a massive amount of money and the Foundation is indebted to so many wonderful people that have assisted us. The Proudlove Family and the Foundation are also eternally grateful to organisations such as Myplace who continue to provide care and support to Warrick and the family in so many ways. From bike rides and fun runs to swims to Rottnest; from commemorative football games and school holiday football clinics to calendars and wrist bands, our huge band of supporters have done everything possible to raise funds for their much loved mate Warrick. A huge thanks to all the shops and businesses in the Albany community who display our fundraising tins and who have contributed over $23000.00 so far. Treatments such as physio, acupuncture, massage and speech therapy costing on average $20,000 per year ?Add to this overnight carers which enable the family to have at least two nights off from getting up to check on Warrick or to turn him over; medicines, supplements, peg tubes and food and you can see that the Foundation still has a lot of work to do to ensure Warrick continues to receive the best care. For further information on the Foundation, please contact our President Ian Haggerty on : 0428 336 281 or our Secretary Valerie Haskins on 0424 961 450 ?